Or, almost like fried rice without any of the guilt! 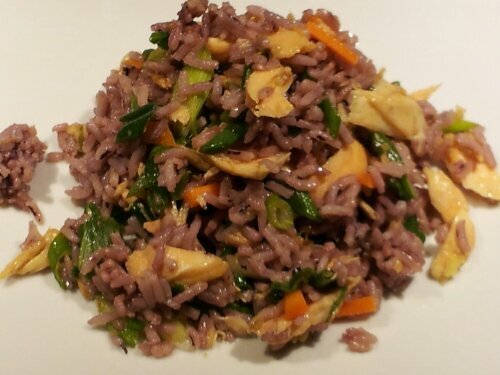 A beautiful rice dish that is good served cold as a salad, or warmed up to amp up the taste in this dish. I was looking for a dish to make for a friend who was recently put on the Dash diet. His doctor has limited him to 1500 mg of sodium per day. That is what you get in a lot of fast food meals: just one meal! There is lots of cutting back going on in that house. He loves sushi, and fish, but can’t have all the soy sauce that we normally like to eat with it. So…I had some salmon in the freezer, had this beautiful Blanca Isabel rice (the Louisiana developed long-grain purple rice), and I just thought that the colors would be beautiful together, especially with some green onions and diced carrots…definitely a dish with Mardi Gras colors! 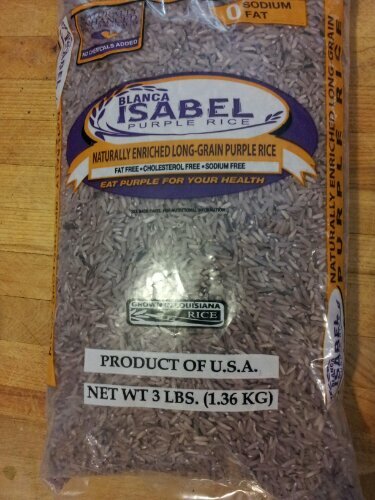 Blanca Isabel purple rice, high in anti-oxidants. Cook the rice in a rice cooker with only 1 ½ cups water. Omit the salt, if desired. I didn’t want the rice to be overcooked and mushy. When I had previously cooked this rice, I had used 1 ¾ cups water, and it was mushy, so I tried it with just 1 ½ cups water, removed the lid after about 5 minutes of timer going off. I lifted the rice to cool it down (remove the steam), and set it in the fridge to cool down. Cook the salmon in the microwave. I had a hard time wrapping my head around this one, but it worked great. I wanted to sear it in a skillet or roast it in the oven. Both of those options would have required some sort of fat and seasoning to be added, neither of which is wanted in the final calorie and sodium count. In short, this is a quick way to get plainly cooked salmon, as opposed to opening a can of salmon which has an extremely high sodium content (for someone who can only have 1500 mg of sodium per day, it’s a lot). And the only thing that got dirty was a dinner plate. Easy cleanup. I microwaved the fish for 2 minutes, checked it, microwaved it for 1…I ended up taking it out and flaking off some of the fish that was cooked on the outer edges. The three inch center of the fillet, the thickest part, had to be cooked for another minute. Flaked beautifully, and it wasn’t overcooked at all. 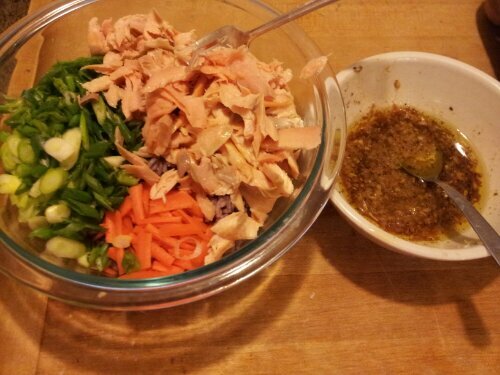 Prepare the dressing by mixing the oil, low-sodium soy sauce, garlic and ginger; stir well. Combine the rice, fish, green onions, and carrots with the dressing and toss lightly. It’s best after sitting a few minutes. Even better the next day for lunch after all the flavors are absorbed. We were both very surprised at how good this was. And filling, too. If I had to eat a low-sodium diet myself, I definitely want this in my rotation. I think it could be done with chicken or shrimp, also. 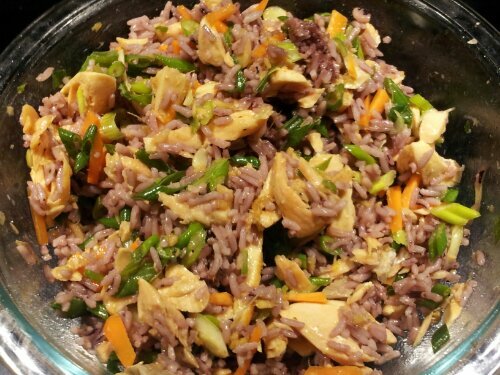 Looking at the ingredients, it is basically the same ingredients as what we use for fried rice, without so much oil and sauce (and no egg). If you can’t have fried rice, you might find this a satisfying substitute. Low sodium note: I used Kikkoman’s low sodium soy sauce, which has 537 mg sodium in one tablespoon. This dish made about 5-6 cups. So, in theory, the only salt in this dish was the 1/8 teaspoon salt in the rice, and this soy sauce. I believe that there are some other low sodium soy sauces that have about half the amount of sodium in each tablespoon, but I’m not sure of the brand.